We are delighted to announce the stunning latest release by world renowned artist, NICOLAS TRUDGIAN. For one hundred years the Royal Air Force has provided outstanding service in the defence of the United Kingdom. Never was this more so than towards the end of the Battle of Britain when London became the focus of aggression from the German Luftwaffe. Daily, from the streets of the city, onlookers witnessed the deadly conflict. 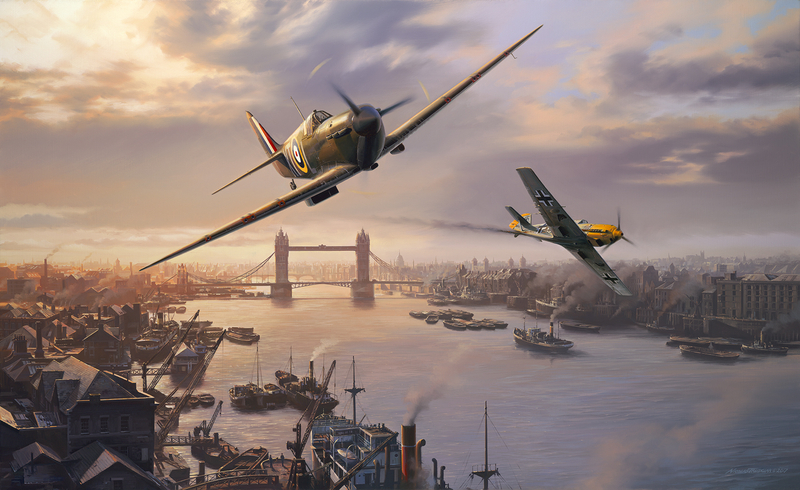 In one of those battles, between a German Me109E and the 603 Squadron Spitfire of Pilot Officer Basil ‘Stapme’ Stapleton, the aircraft were engaged in a particularly frenzied dogfight over Tower Bridge. This specially commissioned painting, 'London Pride', by Nicolas Trudgian, depicts that real event with the artist's characteristic remarkable detail. On one of the many occasions that ’Stapme’ and Nicolas met, they thought up the idea of depicting Basil’s memorable dogfight over the Thames. The sheets of paper that now form the Basil Stapleton Editions were signed by Stapme so that they would one day be published on a special anniversary such as this. What better image to depict the defence of the realm, than combat over the very heart of the nation's capital? Tumbling through the sky, rapidly losing altitude, suddenly, with the river perilously close, the pair separate, the fight unresolved. The fate of the German aircraft is unknown. Stapme, low on fuel and ammunition, stayed at chimney pot height in order to follow roads he recognized all the way back to his airfield at Hornchurch. Signed only by the artist, Nicolas Trudgian. Image size 32” x 19½” (812mm x 500mm). Overall print size 37¾” x 26½” (960mm x 670mm). Image size 24” x 14¾” (612mm x 373mm). Overall print size 28½” x 20” (725mm x 508mm). Each print has a unique original pencil drawing inscribed on it by the Artist, which can be drawn to your own specifications. Drawing size approx: 6" x 2". When placing your order please specify your drawing requirements or whether you would like Nicolas to design it for you. Each canvas is individually signed, in paint, by the Artist. Canvas Size when stretched: 36" x 22"